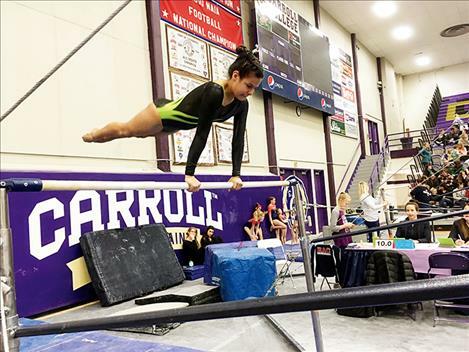 Chenoa Villegas competes on the bars. Lauren Collinge competes on the beam. She finished third in both the balance beam and the vault. Myranda Heiser competes on the bars. 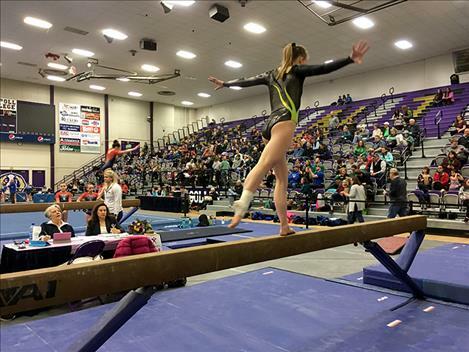 HELENA – Local gymnast Taylor Collinge powered to her best beam routine of the season to claim individual balance beam gold in the Xcel Platinum division during the March 17 Montana State Gymnastics Championship hosted by Helena Athletics Club at Carroll College in Helena. 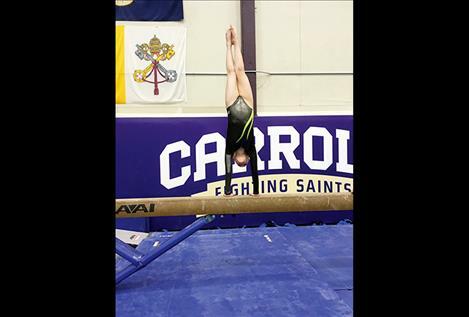 “(Taylor) had a great meet, achieving some significant personal victories along with a huge 9.5 on the beam,” said Head Over Heels club coach Jessica Edwards. She finished the meet scoring a 9.1 on bars and a sixth-place 36.675 in the all-around. Taylor’s teammate and sister Lauren Collinge scored a 36.6 to place third in the all-around in the silver division. Lauren Collinge, in the individual disciplines, placed third in the vault and balance beam. exercise and the uneven bars in which she recorded a 9.4, which was her highest score of the meet. Overall, Villegas garnered a sixth-place finish in her division. 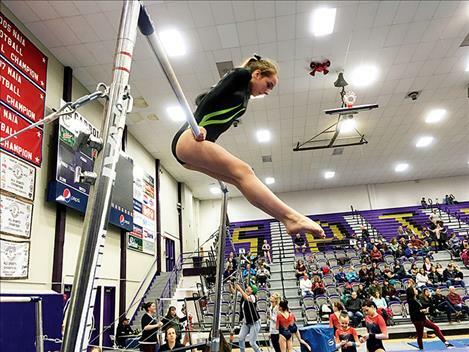 Myranda Heiser split her weekend by playing in an indoor soccer tournament in Whitefish and squeezing in the gymnastics state championships. Heiser had solid performances overall during competition in the gold division. She almost made an appearance on the medal podium. The squad will take a breather for a bit before returning to action June 1 for the Head Over Heels Annual Spring Show, which will involve all the club’s gymnasts, including the tiny tots.